Healing Waters Lodge is the Best in the West: Guest review by Harlan A: I have come to HWL for fifteen years and I keep coming back for many reasons. Friendly owners with helpful, patient and friendly guides, great location, wonderful food and modern facilities. Rivers, streams and ponds to pick from for the best trout fishing that I know. I can’t wait to come back every time I leave. This summer, Harlan brought his wife and future “in-laws” (their children are getting married). 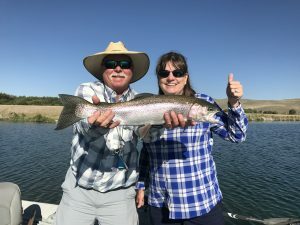 Below is a photo of Harlan’s wife Amy and her guide, Bart, who helped her land a whopper.